I added the finishing touches on “Resonance” today, a unique acrylic and ink commission for a friend that began as a simple homage to Kandinsky and ended as something else entirely. This “process piece” relied heavily on the grid at first, but through phases of revision/negotiation transformed into something painterly and spatial, full of music and movement. I’m not surprised at the direction this took, as I intentionally worked while listening to composers Brian Eno and Christina Vantzou, trying to translate complex layers of sound into shape and light on the canvas. Creating this painting was somewhat automatic, intuitive and even meditative – an experience I’m beginning to explore more deeply with regard to abstraction. Final thought: it’s amazing how “art thinking” can change from day to day. In two consecutive days working on this painting, the first brought me to a frustrating impasse where I couldn’t work out the puzzle of balancing this composition. On the second day, I was able to “see it” with renewed vision and decided how to finish the painting almost instinctively. What a lot of work a good night’s sleep can accomplish! 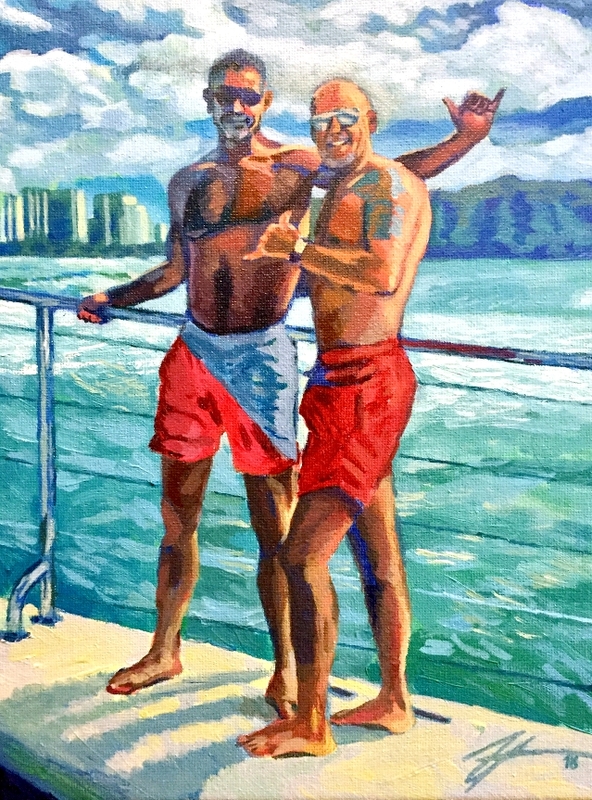 While I was not able to make it to any Hawaiian coast whatsoever during this summer’s vacation, I WAS able to live vicariously by painting one featuring this couple! I’m just wading back into my art life after being entirely consumed with purchasing a home, moving, and getting set up since mid-April. My studio only just came together one week ago! This was a fun portrait project to help get back into it after a long vacation from art. It also allowed me to deepen my skill in painting full-figure humans (versus dogs) in a natural setting. Most enjoyable was the painterly, atmospheric background of clouds and waves in contrast with the meticulously placed daubs of paint here and there to capture the likeness of the subjects. I worked with a limited primary palette to mix all the colors, which I think lends a certain “pure” feel to the overall tone. This was the first painting completed in my new studio space, and I’m eager to move on to many more projects currently floating around in my head! Traction in Abstraction. Painting Abstract Aerial Lake. The Shape of Life. Geology. Depth study. Geese flying, goose guide. Bold, vibrant color. Pure abstraction? Figuration with goose? Content – why pure abstraction? Abstract totem, invokes what I cannot avoid saying. Mr. Jobe Surveying his Winter Orchids. Acrylic on canvas. 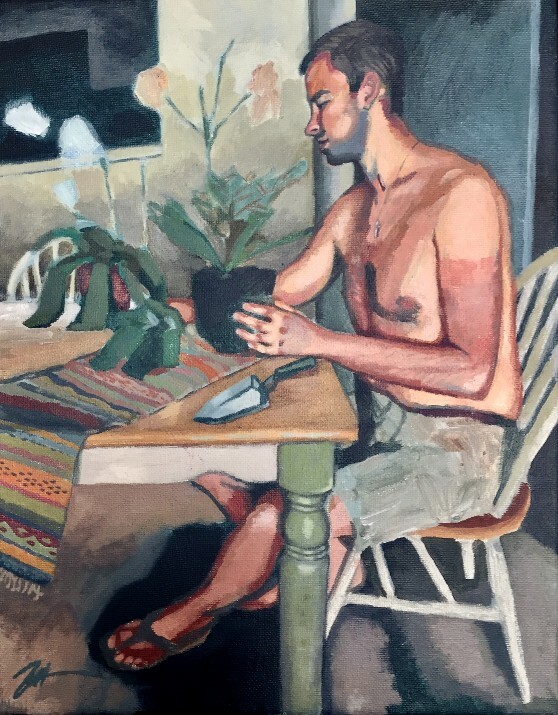 I started this portrait of my live-in, unpaid studio model on the Winter Solstice, intending to compose a painting that looks forward to warmth and growth during the cold, bleak Minnesota winter. I thought about styling this as a somewhat abstract, cubist composition, but was lured into classical representation instead. While this type of portrait is not necessarily my forte, it has been a fun and challenging project so far, and I’ve frequently found myself lost in the long moments of focus/meditation on careful color mixing, delicate glazing and developing depth. In the end, I want the subject to have a glowing, warm feel radiating from the center of the composition, in stark contrast with the hard, chilly light of the surrounding seasonal blues. As I work, I’m trying to channel portraits by Degas and Manet, to name a few. At this phase of the painting, I’m ready to break from reliance on the photo reference and deepen some stylistic elements, embellish the scene and let the visual poetry play out. Incubation. Gestation. Uterus/Heart. Growth & Development. Ripening. Maturation. Evolution. Vessels & Hollow Organs. Heart/Uterus. Impulse. Creative Stream. Universal Generativity. Revival. Resurrection. Resuscitation. These are a few of my favorite things! And/or the wayfinding words I was jotting down in my project book/journal as I set out to rework a ten-year-old self portrait that just needed something more. 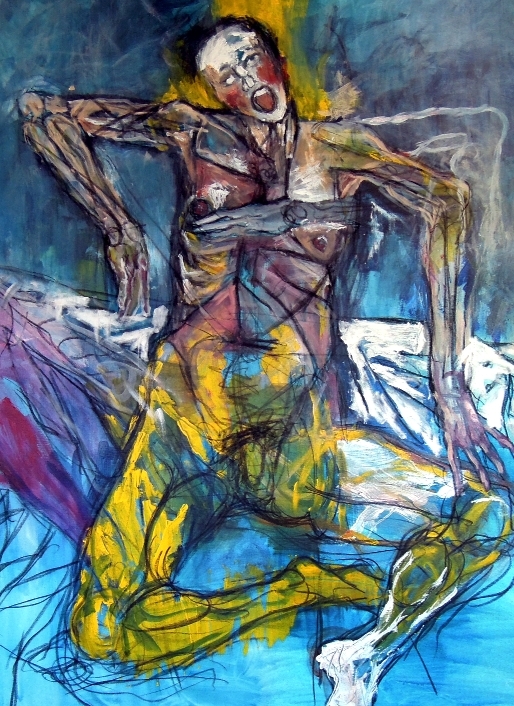 The former painting, a half-baked figure drawing of myself lying in semi fetal position, came from the tail end of my art school years when I was working on expressive figure sketches, mostly in rote, frothy charcoal and muddled with bright, concentrated color (see “Imaginary Figures”). Working through how to transform this piece into something I could be proud of was an interesting process. In many ways, I felt like I was having a conversation with my younger self, recognizing what I was trying to do 10 years ago, and letting that dialog with today’s sensibilities, changed as they are. I found that several of my old tricks and practices have endured and perhaps matured over the years. The same joy in speed and gestural energy is there in the old and the new way of working. I have a better grasp on color and inventive palettes now, something I really missed ten years ago. As I worked through this painting I began thinking more deeply about what it means symbolically to come full circle on a self-portrait. I came across my desire to reinvent without fully destroying this object that my 22-year old self made. I’m reading a biography about artist Jasper Johns, and I was intrigued at a part of Johns’ career where he systematically destroyed his older work after he found his creative niche, erasing the traces of his incremental growth. I have certainly had the impulse to obliterate old paintings, but I so value the idea of ritual transformation that I find inspiration and meaning in the process, the traces leading up to a certain point in time. I like to see the arc of things. Perhaps I really am a “big picture” thinker – my partner mentions it frequently. I remember how lost I felt at 22, facing graduation and the bleak world outside art school, and I wonder if that uncertainty contributed to the savage, transitional quality of the original image. I wish then I could have seen the long view and trusted it. It sounds so sentimental…I tried to have a little overdue self-compassion as I helped this old portrait find a way out of confusion. The result is a somewhat spiritual (if not a little corny), surrealist affirmation of our constant state of change and transformation, a theme that is ever more important in my art practice and my perspective in general. 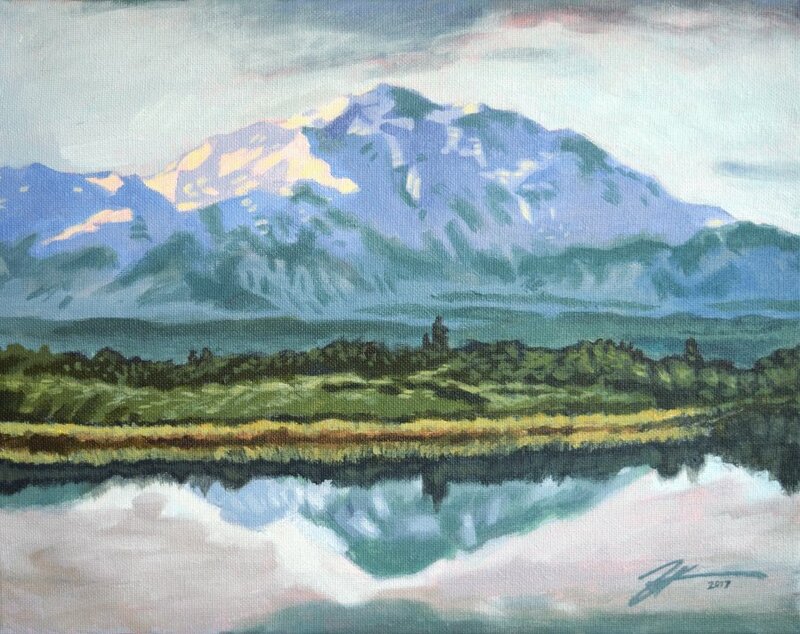 Some fun facts about Denali: the mountain is the highest peak in North America; the name “Denali” was given by the Koyukon people, who have lived around the mountain for centuries (the name was recently changed to “Denali” from “Mount McKinley” in 2015). Thanks Wikipedia! 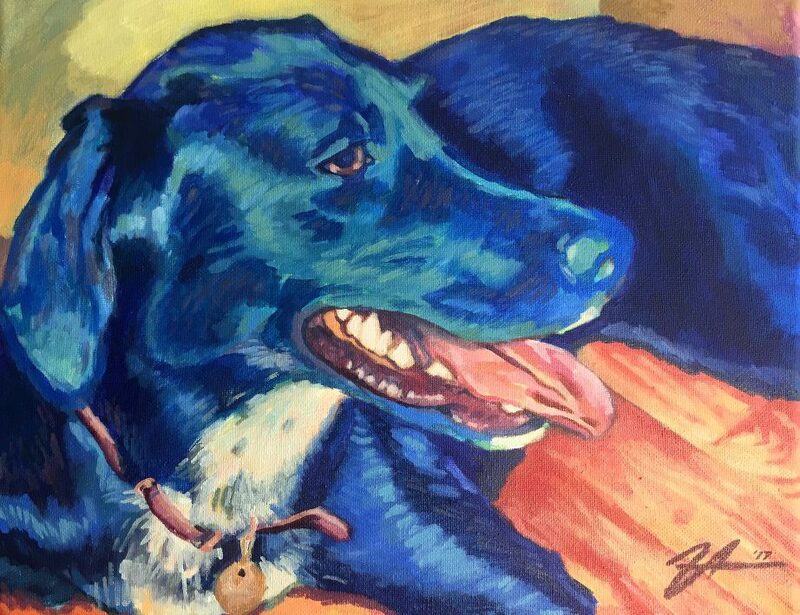 I recently finished this small painting of Denali for a client. This was a fun, short little exercise in landscape, a subject area I don’t generally work in. This year, I’ve finished two paintings featuring mountains and lakes, so I’ve definitely gotten my feet a little wetter. I find that I actually enjoy painting landscapes, which is not surprising given my preoccupation with the abstract shapes and repetitive yet spontaneous patterns of the natural world. “Denali” also allowed for a little more formal practice on creating depth, something I’ve been working on throughout the year. I managed to pump out this painting over two sessions, which says to me my process for paid projects is becoming more efficient. This definitely helps build my confidence as I look forward to more commissions in 2018. A still-life of prismatic containers divides cold winter light into rainbow jets of color, filling my studio space with a brilliant playfulness that leaps away from November’s funeral pall. My assignment was to rework an old watercolor sketch based on a dream about water basins. 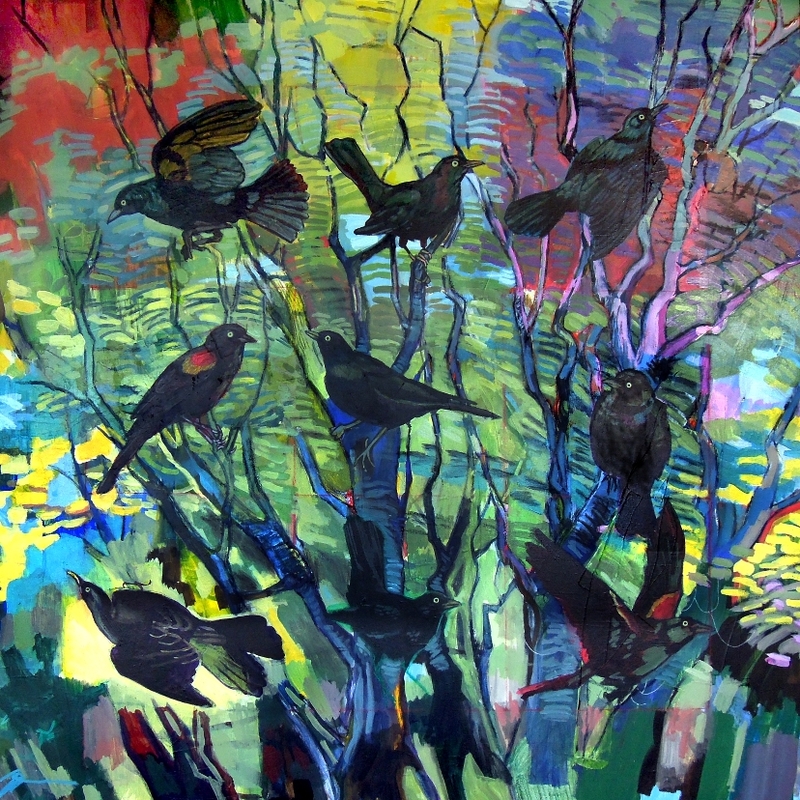 It became a meditation on the warmth, love and trust inherent in my art practice. In October I began volunteering at Vine Arts Center, a local community-run gallery in my neighborhood. During one of our exhibition discussions, another artist discussed his view of people in the world as “vessels,” each in a varying state of being filled, empty, or something in between. Vessels can be reservoirs for anything we can imagine inside them. They can be a potential space or a void. They can be man-made or naturally occurring. Vessels can be filled with physical matter or the intangible. Vessels can be broken or leaky. They hold valuables or transport. Vessels can protect. In short, vessels do a lot of work. I frequently find myself pondering this metaphor as it relates to art and the human condition – I have been curious about how to incorporate it in my work. With this commission, I decided to start with a simple composition of arranged “vessels,” the various containers, plastic jugs, mason jars and empty fruit cups repurposed for paint that litter my studio. I “filled” or imbued the skeleton drawing of the piece with the “core” of my own formal artistic sensibilities: expressive color and brushstroke patterns, heavy contrasts between muted, cold tones and vibrant, living hues, struggle between linearity and ambiguity, representation and abstraction. Throughout the process, I paused to examine my thoughts and actions, took notes, looked inside to acknowledge the intuition that guided my hands, something I have rarely done on purpose. In this way, Vessel Work feels like a deliberate meditation on the spiritual, inner aspect of art creation and what it means to me personally. Warmth and radiation of light are treated with paramount importance. The elements in the working space are tied together and interconnected by their participation in light, their energetic vibrations in the field. The work is related to love – making a painting about (simply) what I love to do is freeing and spontaneous without constraints of any kind. And yet there must be constraints, that tension between rule and misrule, which mystifies and generates beauty. And through this sensibility comes trust. Trust that the work will become what it will – I am reminded of Schmendrick the Magician from “The Last Unicorn,” yelling “Magic, do what you will!” as he grasps at the reigns of a force he can’t control. I cling to trust that in the end, the painting and the artist (and yes, the client) will be satisfied if I play to my strengths, challenge my skills accordingly, and take risks in the creation of the illusion. 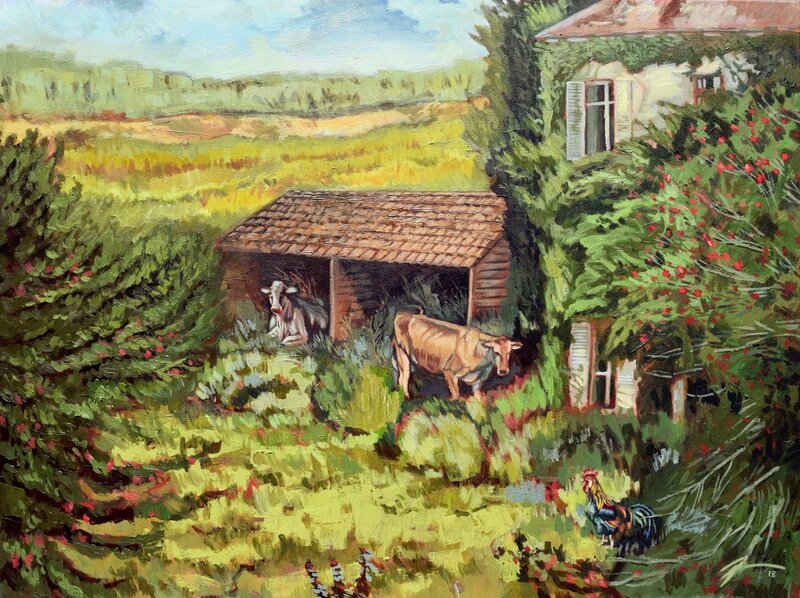 Trust that in painting no act is final, and the painter therefore has relatively less control than it would seem. Coming in the midst of a furious week of art production, here is the formal result of my recent research into cubism! This commissioned piece moderately deconstructs three poses (one model – unharmed in the production process) and the studio space around them. I treated this subject with all of the cubist sensibility I was able to scrape together from online searches, a visit to the Minneapolis Institute of Art, and biographies of the likes of Pablo Picasso and Georges Braques. 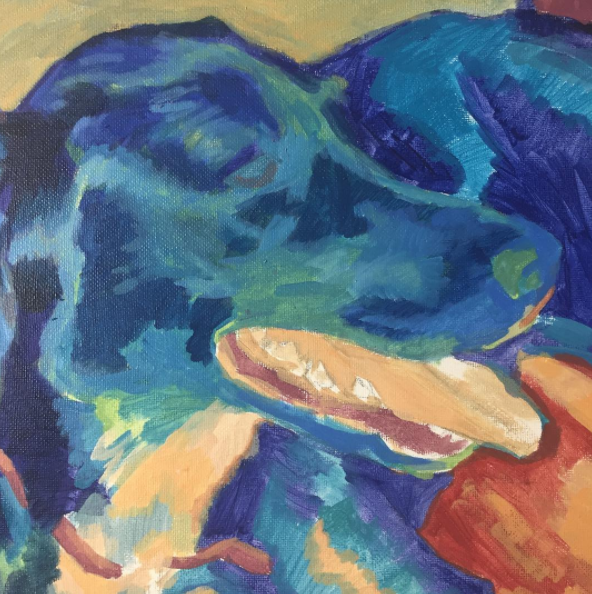 My final composition borrows heavily from Picasso’s bold “Demoiselles d’Avignon” and samples the palette of Picasso’s blue period, Braque’s somber spectrum, and adds an iridescent gold flare because decorative art! This being my first relatively abstract, non-photographic commission piece, the ideas and prototypes came together through consultation. Trading pictures of murals, famous paintings, and devising color schemes, we carved out a shared mental model of the painting to come. I began working on this piece by reading and observing. I was curious to find out what my giant art history textbooks, the internet, and our local free museum had to say about cubism. 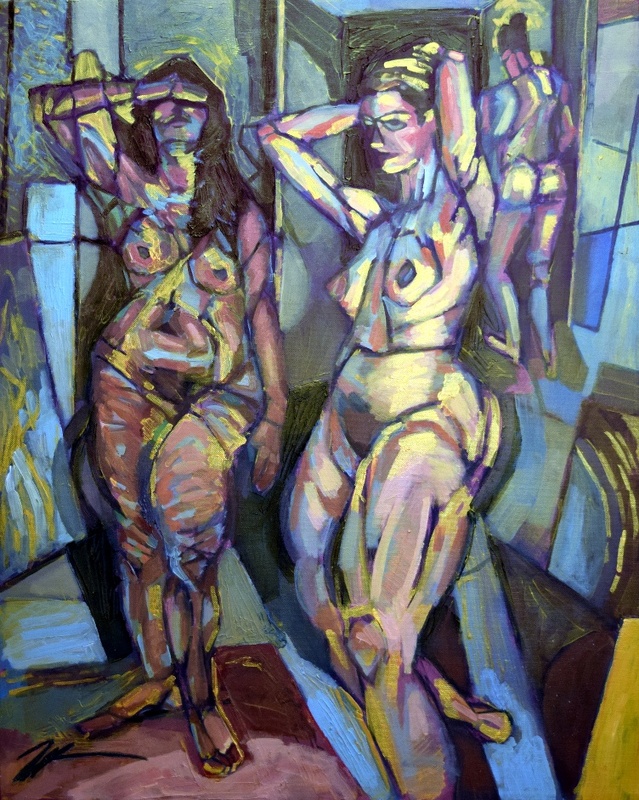 I was surprised to find that certain aspects of cubism were similar to what I was trying to do with “time-lapse” figure painting in the latter half of my art school years, so picking up that line of work felt a bit like coming home. Read more on what I found out about cubism’s “greater context” here. Once I had determined how cubist sensibilities could fit into my style, I invited over a friend to model for some gestural sketches. These loose and expressive sketches helped me form the basis for the figures and I built up the geometric environment around them. 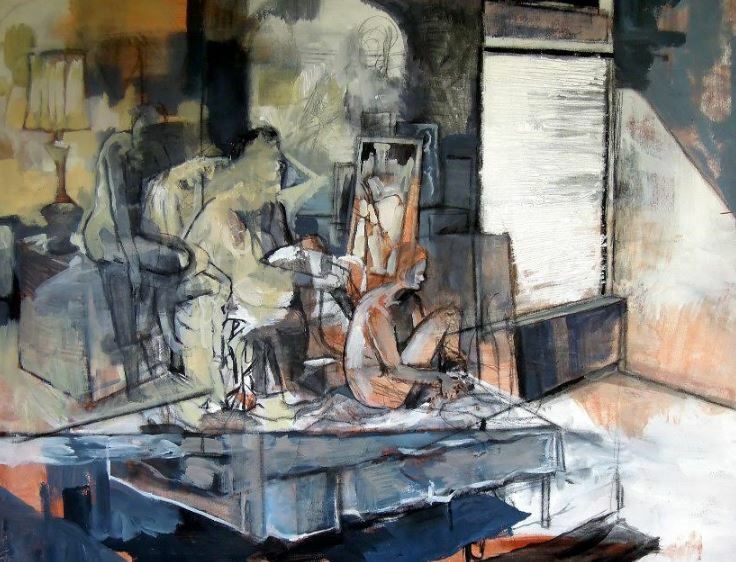 From there, the challenge became walking a thin line between decorative, calculated abstraction and representational figure painting, my client preferring something in the middle. See process snapshots below. I could go many directions from here in order to fully invest in this way of working. Some cubists section off the surface in such a way that objects and bodies are barely recognizable, obscured by geometry and the conceptual/perceptual notions of cubism. 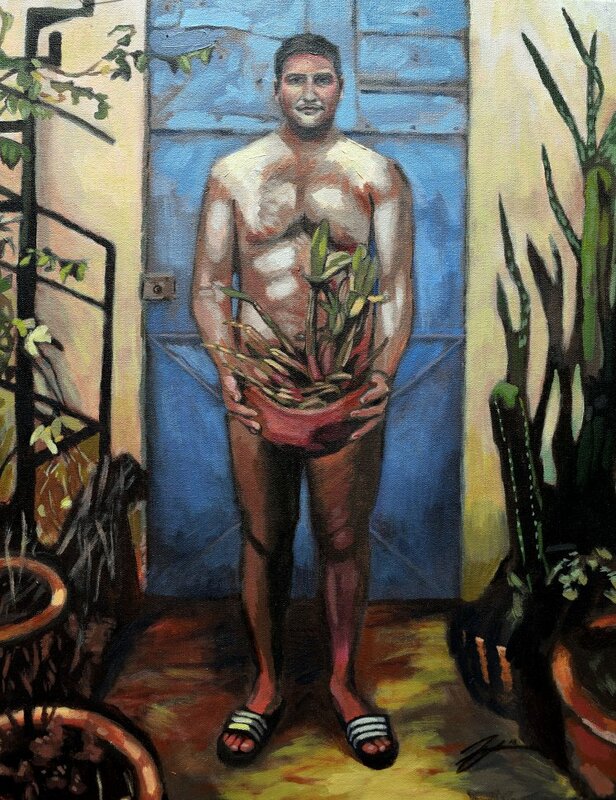 Which to me is less interesting as I am still in love with drawing and painting the human body. Another idea is to fully push the idea of poses changing through time. I recently attended a figure drawing cooperative at a local art academy, and wondered how I could incorporate all the 5, 10, 15 and 20 minute poses over four hours into the same composition. The final result would probably be something quite abstract but also quite recognizably human. Overall, I have befriended cubism and feel like I’ve grown a bit as an artist after examining and producing in this way. I’m eager to get deeper into the water. Waking up one morning shortly after the recent Charlottesville, VA riot, I read a headline about Baltimore, MD’s confederate monuments being removed by overnight work crews. Gleefully scanning through the report, one particular photo in the article caught my eye and I immediately wanted to make a painting after it. 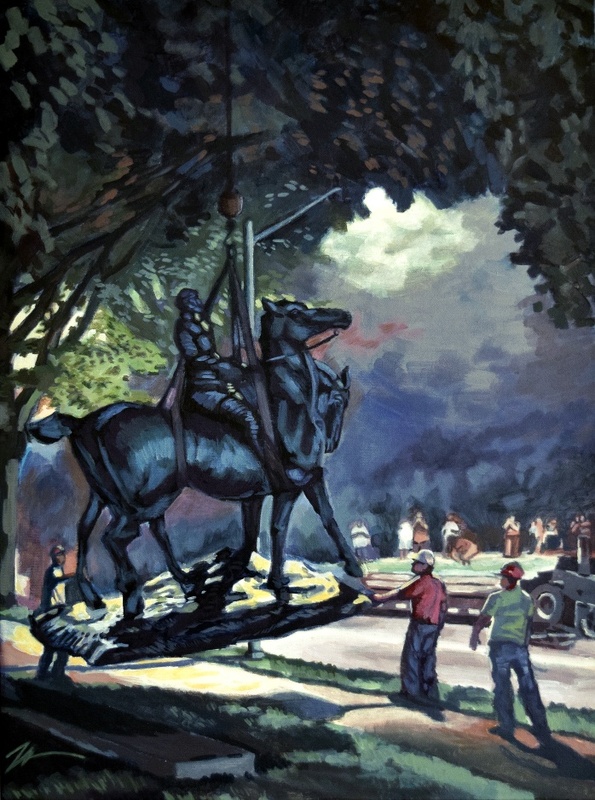 In the image, a hulking Robert E. Lee and mount are lifted by a crane and balanced by work crews as they are carried away from a public-facing pedestal. Onlookers line the background snapping photos with their phones as the piece is hoisted up and away, towards a consuming yellow light at the top of the frame. For some time I have wanted to challenge myself to paint in a traditional/classical style as a way to exercise my formal drawing, composition-building, and glazing skills. The Romantic movement painter Eugene Delacroix’s work has been a particular favorite of mine, with deep contrasts, expressive brushwork and attention to narrative drama and intrigue in his choice of subject. 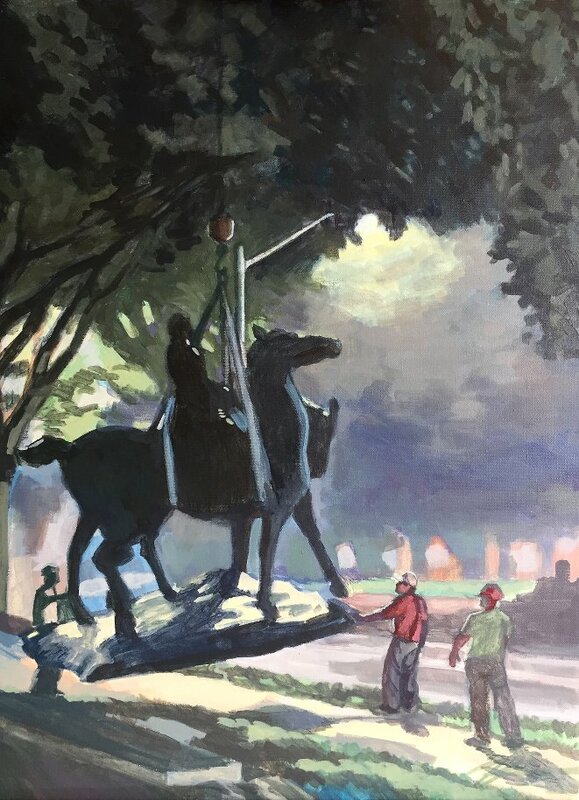 The snapshot of General Lee’s flight from public presence in Baltimore brought to mind several epic paintings of horses and social struggle rendered by Delacroix. Below is an example I chose to guide my work on this piece. Removal of a Confederate Monument at Baltimore, MD, or Flight of General Robert E. Lee (working titles). Acrylic on canvas. 18 x 24. Eugene Delacroix. 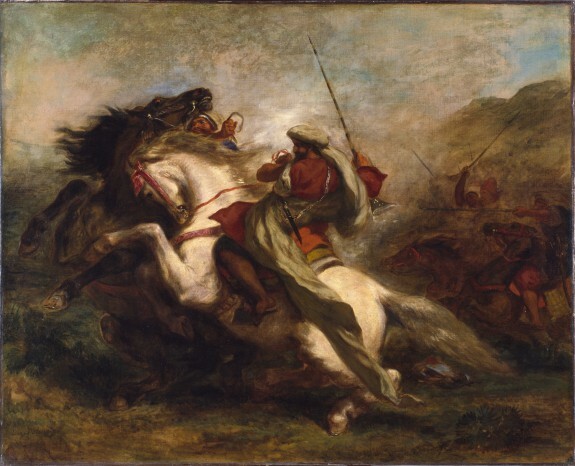 Collision of Moorish Horsemen (1843-1844). Oil on canvas. 32 x 39. A revelation in working at this style has been the liberal use of dull gray tones, something that is fairly alien to my regular practice. The muted earthy hues contrast sharply with areas of color to help direct focus and create drama, a use of color I am beginning to more fully understand. In order to achieve the lush, complicated surface in Delacroix’s work, I’m working at glaze layers and attention to detail where I want the viewer to focus. At this point, I’ve blocked in most of the compositional elements and contrasts, and the surface is ready for finer treatments of the overall atmosphere, details, and stylistic features. Lastly, I am intrigued by the conceptual interplay of painting in a “historical” style while calling into question the notions of history, justice and public space currently in debate. 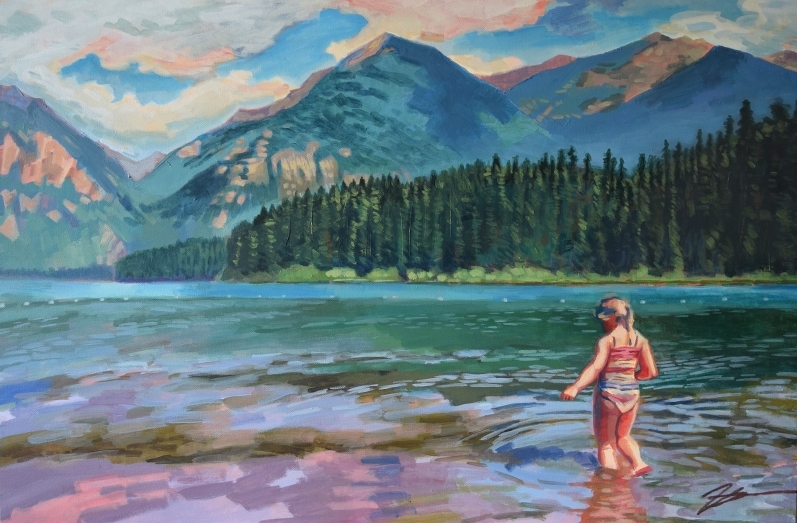 Here is a painting of my cousin’s little girl wading into Holland Lake, a favorite swimming spot nearby our family’s cabin in northwestern Montana. The Swan Valley and locales along highway 83, located between the Swan and Mission Mountain ranges, hold special significance for our family. Many generations of kids have swam in Holland Lake or hiked to its falls, collected its thimble berries and careened at high speed on a giant inflatable crocodile over its mini whitecaps. I was excited to take up this project because the composition marries majestic landscape with figure work, and works easily with all the expressive brushwork I love to do. The most vexing part of this work was the sky and clouds – it was difficult to make them “fit” with the rest of the painting. Clouds in most reference photos are not exactly aesthetically pleasing. I could benefit from doing some plein aire cloud studies to get a knack for this. As usually happens with my paintings, there were several points where I wanted to stop and leave the surface alone because I saw a particular vibration or movement that I did not want to overwork or blunt. My sense for when this occurs is getting keener because I am beginning to understand what exactly is exciting for me in this media. For work like this, the key is finding the intriguing balance between stylization and realism, tension between abstraction and representation. 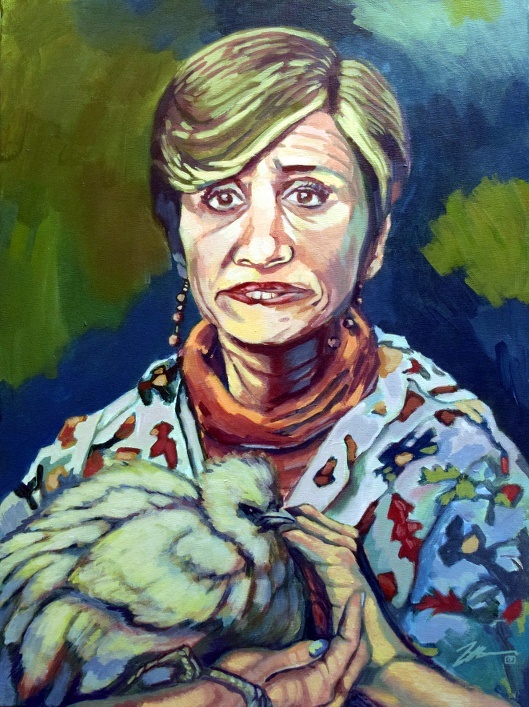 Portrait of Ms. Blank. Acrylic on canvas. 18 x 24. My favorite part of this piece was working on Jerri’s startling, charming face. Her tired, experienced eyes reflect her time in Florida’s “harsh” penal system, glassy from all-night benders in X trailer park. Her cracked and quixotic smile with spastic lips from years of eating glint and whatever else was unlucky enough to meet her mouth. Finally, her ornate floral blouse adds to her crooked splendor in this definitive portrait of Ms. Blank and Suki the Japanese silky. 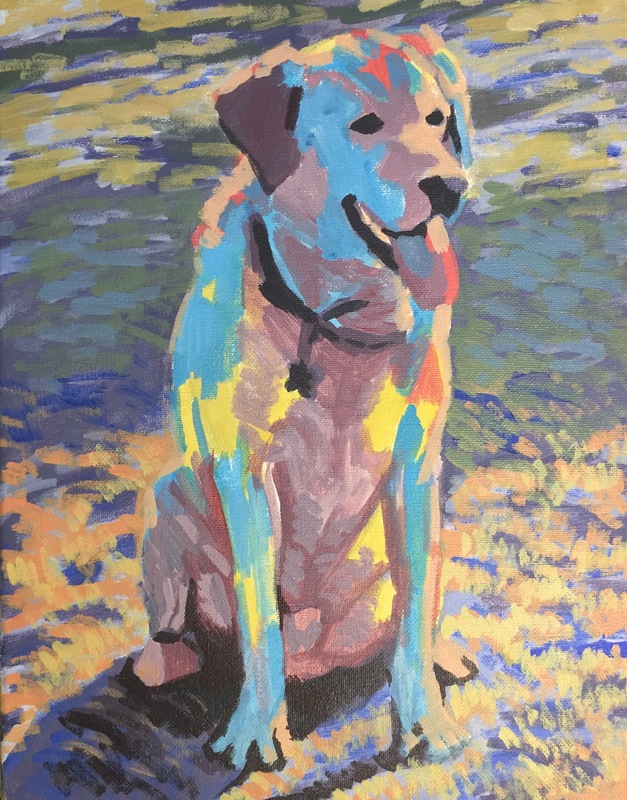 Seriously though – this represents my first true attempt at straight portraiture of the human species, although my friends originally considered this their pet portrait! Poor Jerri. It’s amazing how the slightest alteration or shift in a facial feature can completely throw off the recognition factor or make something look odd. I discovered that human portraits require a great deal more precision than animal portraits. Another process I worked through was building up the skin in layers. There are so many colors and tones inherent in the skin, and not all of them are distinct yellows, reds, tans, etc. If you look at your own hands now, you will see the majority of your skin reflects a transitional gray tone, depending on the lighting. Finding the balance between tone and depth in Jerri’s face and hands was a challenge. I’m excited to take on more portrait projects so I can keep exploring how to paint human skin. Returning to figure work with this study of a certain live model in my partially re-packed apartment a few weeks prior to moving. 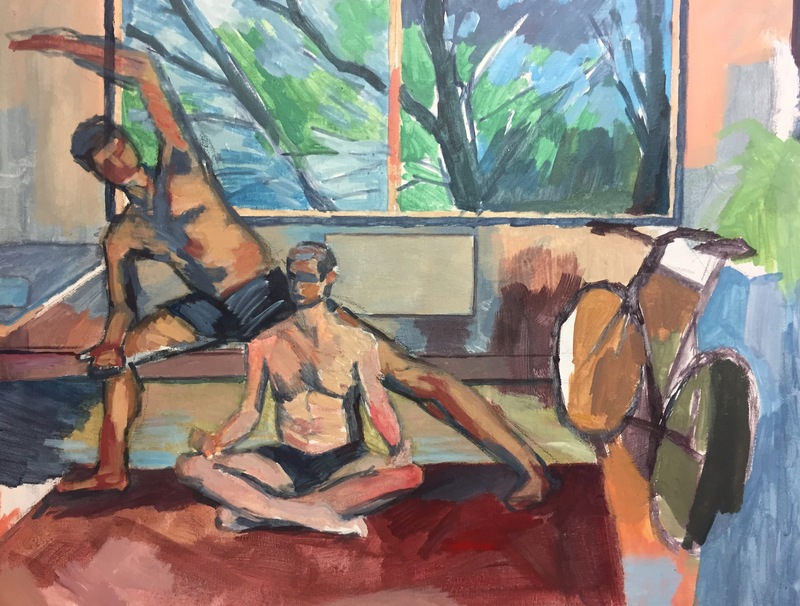 It is beyond exciting to come back to the classic and familiar gestural sketch of art school, and then combine that sensibility with my slow but eager, semi-abstract exploration of figure in relation to space and place. I’m trying hard to transmit how the sunlight filtered by the tree outside my window washes into and fills up my living room, now rendered a “transitional” space as recognizable domestic shapes are packed up and stacked in boxes and piles to the right. 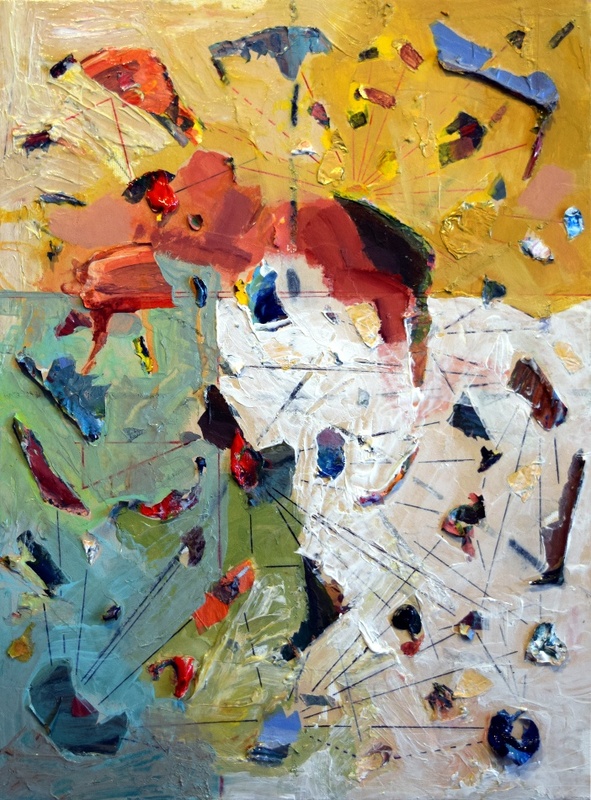 Transition or “interval” is central to my exploration of the time inherent in painting. 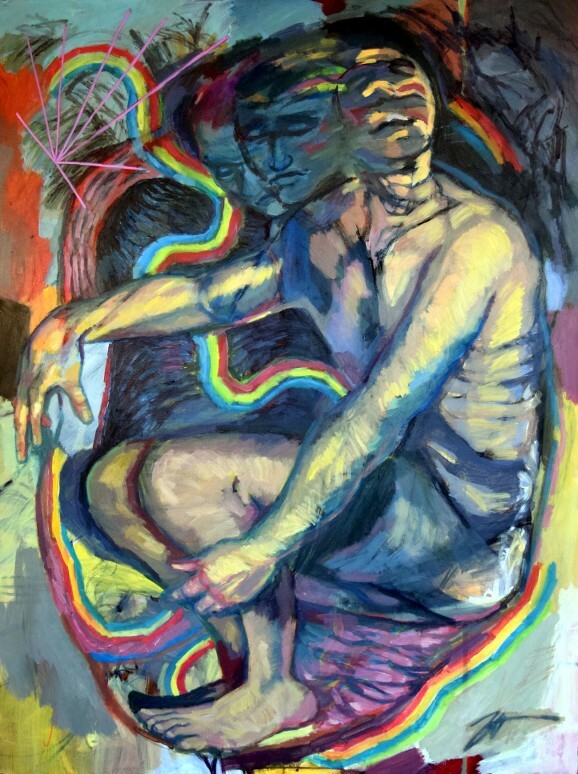 This piece reminds me of an older figure study, but my risk-taking with color has certainly evolved. A time of change is ripe fruit to crack open, let the creative juice flow. 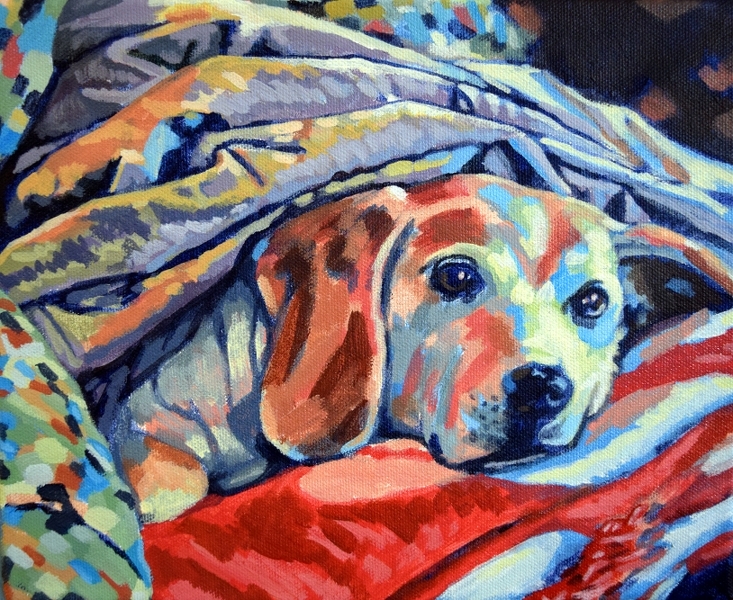 My latest project, a portrait of my second cousin Anna’s pooch Schatzie, is now finalized! This was an incredibly fun piece to work on, both for the larger size, the opportunity to play with color, and the detailed brushwork that such a close-up demands. In this portrait, I continued to tease out color nuances and “transitional” hues between distinct color stations, as well as creating a sense of depth, an overall goal in my painterly development. Throughout this process I also dove deep into the rich complexity of the color blue. 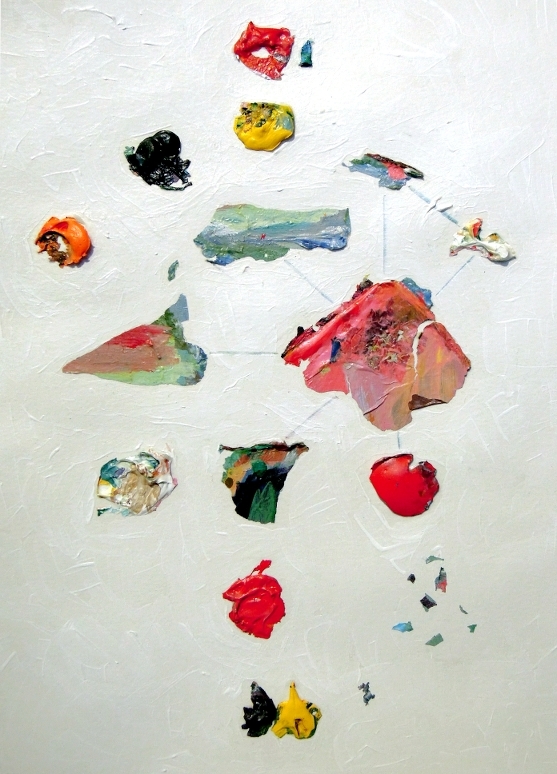 Particularly, I worked with ultramarine blue – a sober, stoic blue who does not want to be green or violet, and would much rather fade to gray than roll with change – and primary cyan, an energetic, electric blue that readily mutates but has a naive quality that is somewhat related to finger paint. As I worked through the phases of this portrait, the intriguing synergy (yes, synergy!) between these blues became the primary focus. Overall, the pet portrait projects have blasted off. So far this year I have had four commissions, and there are a handful in the pipeline, including portraits of two-legged (read: human) subjects. 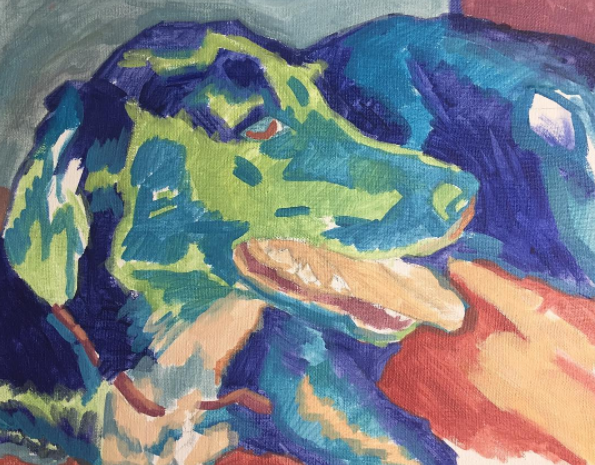 Through these portrait commissions I have begun to carve out a unique style, deepen my understanding of color theory, practice classic techniques such as layering and glazing, and also develop my business sense as an artist – something I certainly did not learn in art school. They also help me escape from puzzling over my recent abstract work when I get in a rut. Working on this pet portrait commission in the hours between three consecutive night shifts! 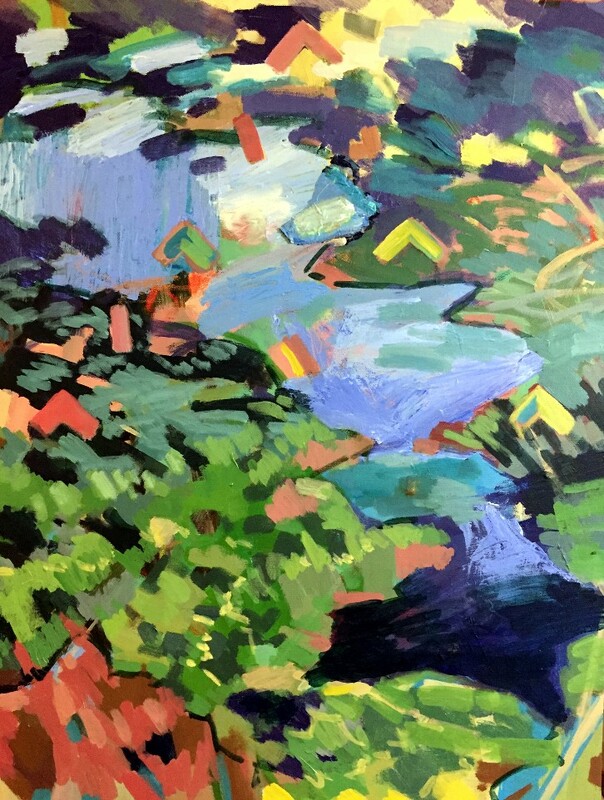 A vibrant underpainting and loose, expressionist style is giving me ample room to explore simple depth and intermediate tones. I’m trying to mix color quickly and intuitively to avoid the traps of overthinking. The result is so far quite beautiful and reminds me of Van Gogh or Paul Gauguin palettes. Making abstract art is difficult. 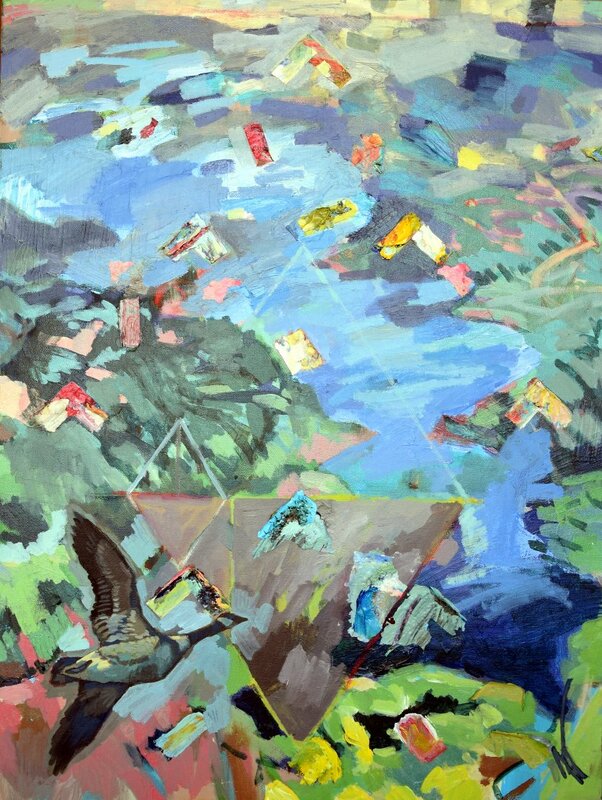 Trained mostly as a representational painter, I have always found navigating the ambiguity of abstraction a murky, sometimes arbitrary task. However, that foggy negotiable space is crucial to what I admire in painting, and factors into the creative process I’m developing. I’m often seeking a particular balance between real and unreal, objective and subjective, visual equivalents of prose and poetry. Thus these days I have committed myself to explore terra incognita and foray into non-representational pursuits when I’m not painting a cute doggie. Why is abstract painting so challenging? [Start stream of consciousness on the subject of abstraction.] Without a reference, there are endless options, and I’m repeatedly puzzling over the questions: what am I doing? Why am I doing that? How does this relate to the concept I am trying to convey? Should I even be thinking about this so hard? What is life? What the f*ck? Mostly, I end up sort of making progress on a general concept, and then find myself working through several aesthetic “problems” that I try to address using my creative process. The biggest question here is “what do I do next?” When I’ve hit a rut and I’m thoroughly in the weeds, I’m usually trying to find an interesting way to create visual balance or break through that particular point in the painting’s creation. The tricky thing is finding a solution that makes sense with the original concept and so forth, which may in turn create another aesthetic “problem” to be solved. The second tricky thing is going through these cycles in a way that is not something trite or [insert distasteful word here]. Maybe I’m not sure how to describe what I’m specifically avoiding. Probably kitsch. There are more unmentioned tricky things. As you can see, I still have not fully jumped off the cliff. The “abstraction” above involves some very recognizable shapes: craggy peaks, a glacial lake from high above, water reflecting the sky, some distant road networks. The chevron-esque shapes invoke migrating birds, hang gliders, proteins folding into themselves, or chromosomes. This unfinished piece is somewhat related to a concept I have been working on called the “shape of life,” or critical, redundant shapes and patterns in nature that iterate at microscopic and macroscopic levels and carry meaning. More to come on this at a later time. 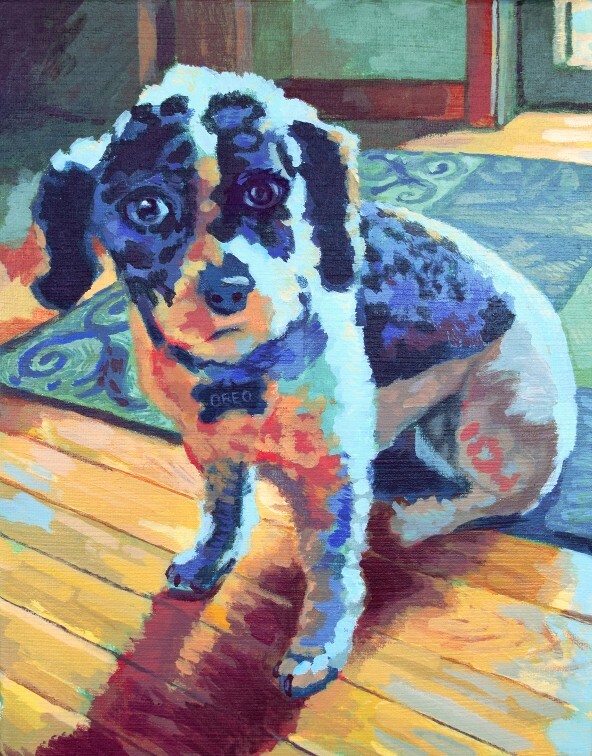 Today I am wrapping up this colorful portrait of Oreo, my coworker’s adorable bichon poodle (Poochon?) 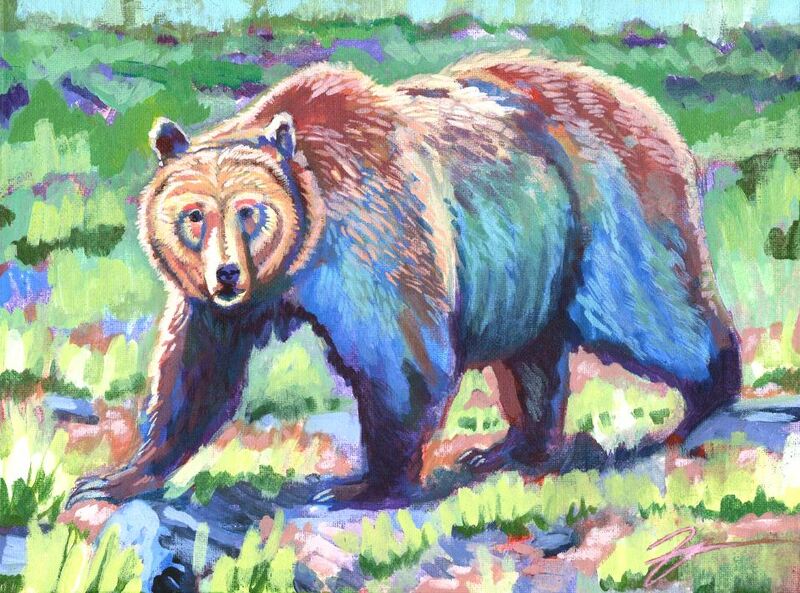 I began this piece with a standard grid and built into a loose, colorful underpainting. From there, I made small adjustments until the colors were just right to match my colleague’s home decor, jumping off the canvas in high contrast sage, rust red, sunny yellow, and umber-stained cerulean. As I have done in previous work, I developed a color palette using Adobe’s Kuler tool with input from my client, then worked within those tones as I layered using the “heavy over lean” technique. I received this portrait commission a few days ago, and had fun with the composition and colors! The most challenging aspect was converting the neutral gray tone of the uppermost comforter into more visually appealing hues. The lines and shapes of the drapery challenged me to concentrate on the drawing through all stages of the piece. While putting on the final layers of paint, I actively worked against my instinct to preserve thick, dark, illustrative lines around everything. This tendency is evident in many of my other paintings, and I believe it originates from my “comfort zone” of line drawings. 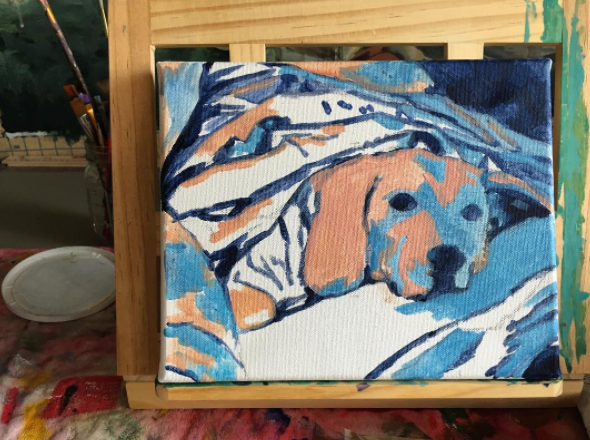 Other considerations: working on creating the illusion of space and depth, as much as a zoomed puppy close-up will allow. 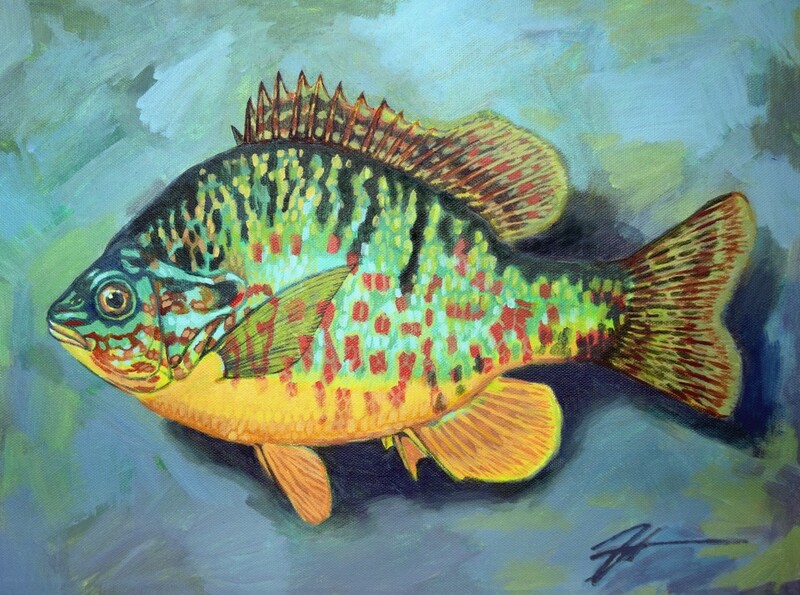 See the underpainting below. Why “dynamo?” Strictly speaking, “dynamo” indicates a generator of some sort, which converts electrical energy to mechanical energy. I once came across this word in a short story, used to describe a dark forest ravine. I never got away from the imagery of the ravine filled with the energy of frog croaks, insect whirrrs, leaves rustling, water flowing etc. Earth/Nature as limitless battery, endless potential for conversion, transformation and sadly, exploitation … It’s fascinating to observe the world this way and to recreate the exchange of energy in the act of painting, which is itself a form of exchange and re-genesis. Coagulation Study no. 1. Mixed media on paper.